Ever heard of the “Phases of a First-Year Teacher”*? If you haven’t, I’m sure you will. According to the studies, I am in the disillusionment phase. This means at this point I am more likely to get sick from being highly stressed and I’m beginning to feel inadequate as a teacher. How right they are! I am exactly at that point. Every day, I come to my classroom with renewed zest for teaching and try to think positively about the day. Lately, it seems no matter how much I plan or stress, I still am dissatisfied. My parents and husband would say this is because I am a perfectionist, but I’m going to blame this one on the disillusionment phase. I heard one of my colleagues say in a meeting, “I just don’t understand how I am supposed to do this. I put everything out there, put all of myself into planning for these kids, and it still doesn’t seem to make any difference.” One of the senior teachers wisely responded with, “What are you talking about, you are making a difference!” She then went on to explain that sometimes we don’t always realize the difference we are making. I have found it so helpful to take time to notice the little things in my classroom. Maybe I’m just an emotional and stressed teacher, but I find myself tearing up over the littlest things that happen in my classroom. These things remind me that I am not a failure and that these kids are learning from ME! Let me share with you a little of the sunshine that I have noticed in my otherwise stormy and stressful days. About a week ago, one of my students looked into his desk and could not find his tickets (tickets are a reward system in our classroom and throughout the grade level. You would think they are equal to gold…). This student frantically started tearing through his desk to find them. He then began sobbing uncontrollably. Before I could step in, my tough-guy, football-player student walked up, patted him on the back, and asked what was up. Tough guy returned to his desk, took out his tickets, and then put them on the other student’s desk and said “Keep ‘em.” Next thing I knew, this little boy’s desk was piled with tickets from our class. Push me to tears why don’t ya!? So when you are teaching, whether in practicum, student teaching, an internship, or in a career, take the time to notice the little things. Look over at the one kid that is on task and breathe a sigh of relief that at least one kid listened. Celebrate that 53% your low student got on their test, it’s an improvement from the 30% last time! Really listen to those sweet compliments your class gives you, kids don’t lie! If they say they love you, they really do! Get a calendar and write down a quote a day from your students that made you remember why you are teaching. When you get down, look back on those quotes. In teaching, it isn’t the big breakthroughs you’ll remember, it will be the little things. Do your students start with the same word at the beginning of each sentence? 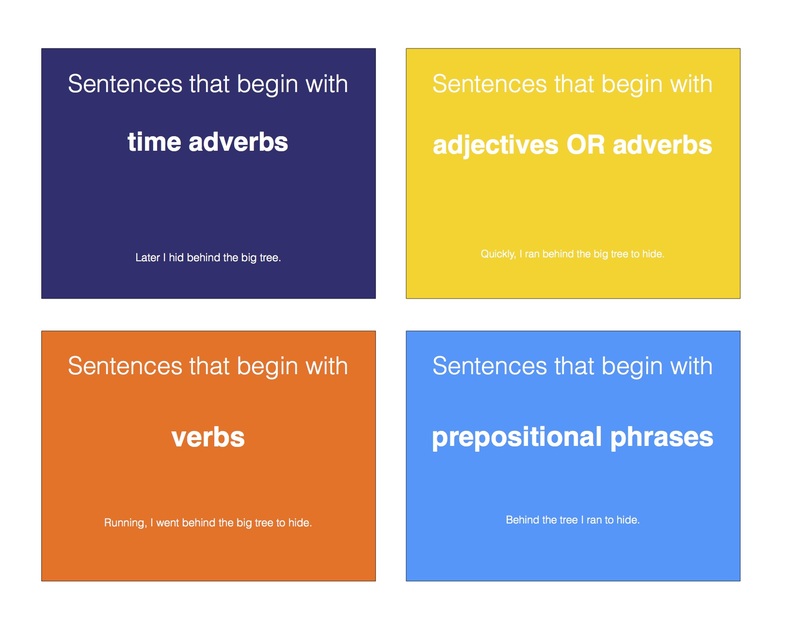 Are you struggling trying to find new ways to teach sentence variety? 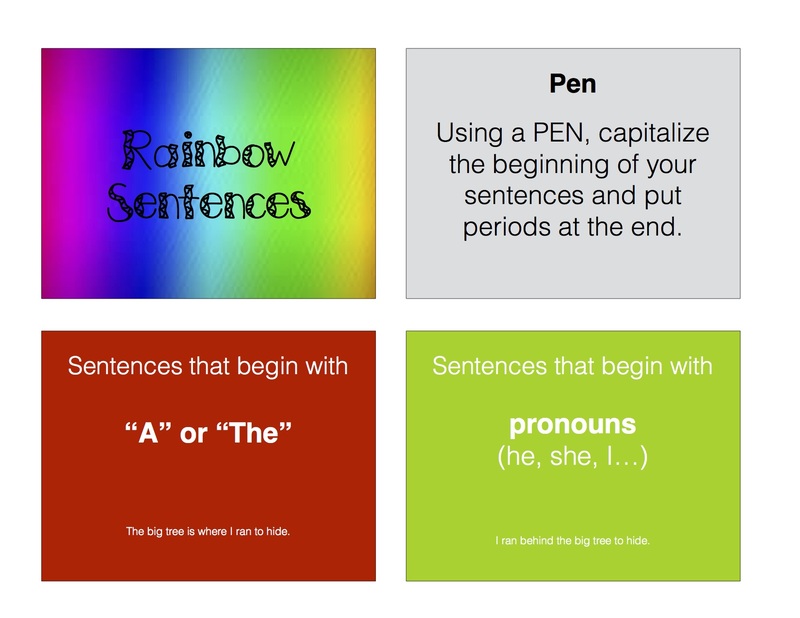 Help students with their sentence variety by doing Rainbow Sentences! When your students are done with the rough draft of their story, have them read through it underlining each sentence with a different color depending on what word the sentence starts with. If they have a lot of one color, they try to change some of those sentences to a different color to add sentence variety. If they are lacking a color, have them try adding some sentences that start with that type of word. Dedicated to the BYU Professors and mentors who have shaped me into the teacher I am. How could any of my professors have prepared me for the twenty-eight unique children that walked through my doorway on the first day of school? They couldn’t have. No one could have. Each child not only had successes and struggles prior to coming into my classroom, but also had a story behind it all. How could my professors have prepped me for a child that walks in with an Individualized Education Plan (IEP) that receives Special Education services but is also a ward of the state with no home support and is struggling to learn English? You’re right, they couldn’t have. 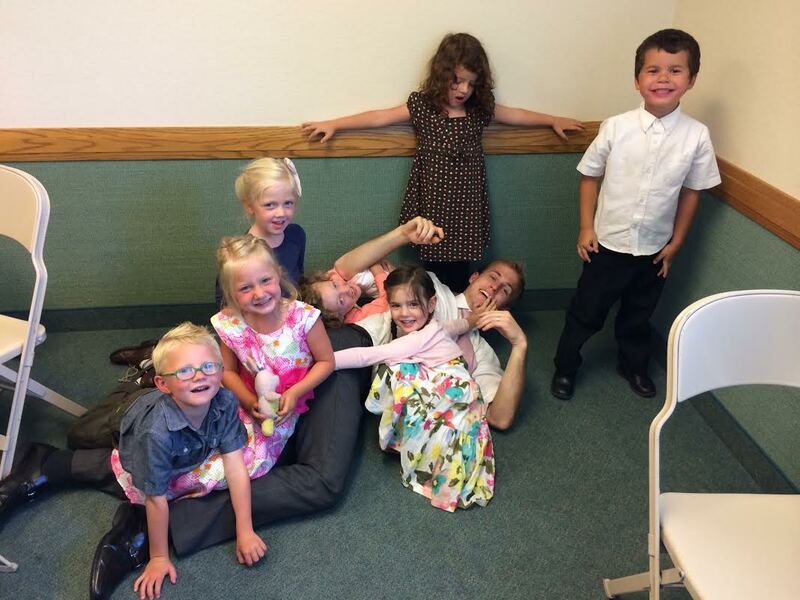 Back in my classes at BYU I would ask, “What is the best way to deal with misbehavior in the classroom?” Time after time I’d hear, “Well… it depends.” My teachers taught me that misbehavior in the classroom is never because the child is inherently bad. It always has a reason. In my five weeks of teaching, here are some experiences I’ve had with misbehavior. One student was throwing pencils at another student. When I asked the poor child that was being attacked by a barrage of pencils to come talk to me, he became belligerent and argumentative. The perpetrator had no problem coming to talk to me. Why? After many tears and much confusion and frustration, I figured out it was all because the student who was being attacked thought I was going to get upset and punish him. His misbehavior was an attempt to avoid punishment. Not very logical, but to a 3rd grader, it was the best option he thought he had. So he misbehaved. The other day, a little girl in my class told me to straight out “stop it” and started to yell at me when I took her out in the hallway to sort out an issue. Why in the world would she think that was appropriate? Turns out she figured out in prior classes or through home life that when she argues with an adult, she gets attention. Negative attention mind you—but attention nonetheless. In her mind, misbehaving is her way of fulfilling her need for attention. A boy in my class called out constantly, refused to take his reading test, and continually argued with me. I could not figure it out, so I called him out in the hallway. As I talked with him, I felt prompted to ask him if he had been called a “bad student” in the past. The big, tough, tackle-football-playing third grader teared up and nodded. He could barely get his words out. He was acting up because he was already labeled as a trouble maker. Simple as that. Now what do all these experiences have in common? All the students were argumentative and didn’t listen to me. Imagine if my professors had said “When a student gets argumentative, you need to…” and gave me a formula for stopping the behavior. In three similar situations, one I simply had to take the student aside and explain I wasn’t mad. Another one I needed to ignore her until she behaved, then give her attention and praise once she complied. My last one is still a work in progress, but he just needs a reminder to behave and be given constant positive reinforcement. How grateful I am that they told me in my classes that when it comes to all things in the classroom, “well… it depends.” Because truly. It does. I am glad they challenged my thinking and forced me to answer my own questions. That has made me the teacher I am today. Each Sunday, my husband and I work with a small group of four-year-old children. As I watch these children, I am surprised to learn so much about the pure nature of human beings. In our wonderful group there is a boy who suffers from physical ailments as well as some social difficulties. As the children play with one another, I am surprised to notice that the innocent children in our class do not even recognize that this young boy is different. Instead, they treat him exactly like they treat each other: with love and respect. This is true courage. These children, despite their differences, reach out to one another. As a teacher, look to your children. They will guide and teach you the importance of living bravely. Today’s world is full of those feigning bravery. In fact, the true nature of courage is being buried. Instead of true bravery, people today attribute courage to those who are the loudest or hold the individual the strongest opinion. Instead, I believe courage is quiet and meek. Not all truly courageous acts are committed for the world to see. Courage is being a friend to those who have none. Courage is learning to say no when everyone around you tells you to say yes. Learn from your students the true meaning of courage and teach them. Your life and theirs will surely be blessed.